I’m a true believer that bacon enhances dishes like no other ingredients. 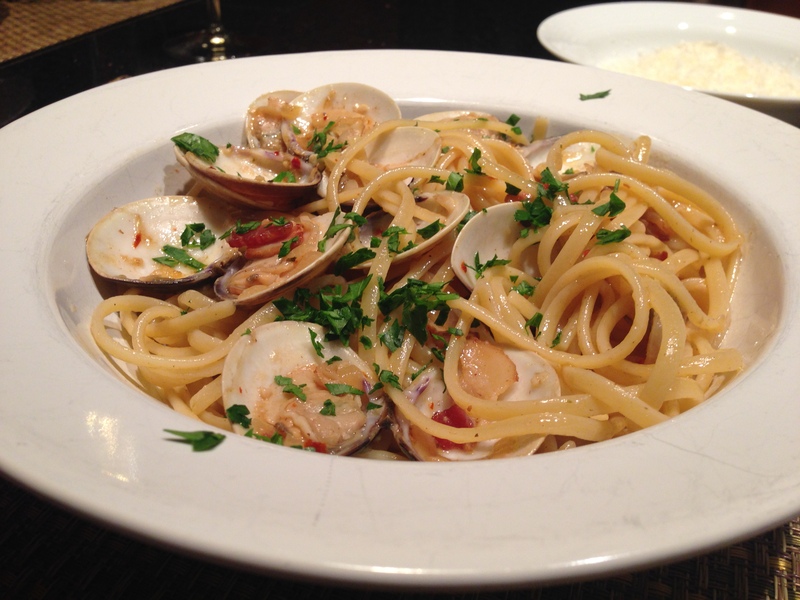 Hence my take on linguine with clams. In the large heavy pot, in medium heat, cook the bacon until fat is rendered. Do not let it crisp. Add the olive oil and let it heat up in the pot, about 2-3 minutes. Add the onions and sauté until soft and the onions are clear. Add the garlic and cook for 1 minute, until fragrant. Add the oregano and the crushed red pepper and sauté for 1 more minute. Add the wine and the clam juice. Allow to cook until the alcohol has burned off and the liquids have reduced, about 7 minutes. Add the clams and cover for about 7 minutes. Remove the cover and check, the clams should have opened up. Discard any clams that remain close. Meanwhile cook the pasta per the instructions. Drain the linguini and add it to the clam mixture and toss until well mixed. Divide into bowls, add chopped fresh parsley, and serve. Hints: I cook the pasta just under the allotted time. This is because the pasta will still keep cooking in the sauce. So if the linguini takes 11 minutes per the package instruction, I start checking the pasta at 9 minutes and more often then not, I stop at 10, drain and add it to the sauce. Yes, I add parmesan cheese to this dish. After all, I am from Wisconsin.